Russell Westbrook, who had his ninth career post-season triple-double in Oklahoma City's Game 1 loss, finished with 14 points, nine rebounds and 11 assists. He was pulled with 3:31 with most of his fellow starters after Portland built a 112-91 lead. Portland's victory in Game 1 snapped a 10-game post-season losing streak that included four-game sweeps in the past two seasons — first by the Warriors and then last year by the Pelicans. Lillard had 30 points in the 104-99 win on Sunday. 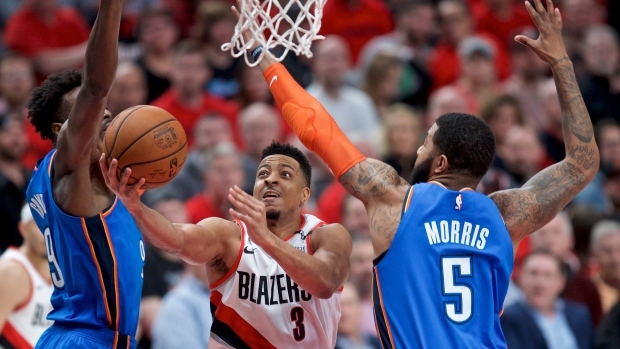 The Blazers' hopes for post-season success appeared to take a blow last month when centre Jusuf Nurkic was lost for the season with a broken left leg. Nurkic was averaging 15.6 points and 10.4 rebounds when he sustained the gruesome injury during a game against the Brooklyn Nets.